Pazhavangadi Maha Ganapathi Temple is one of the most famous Lord Ganesh temples in Kerala, situated at East Fort, Thiruvananthapuram. Located in the heart of Trivandrum city, the original idol of the Pazhavangadi Ganapathy Temple is a small idol of Lord Ganesh, with the right leg in the folded posture. 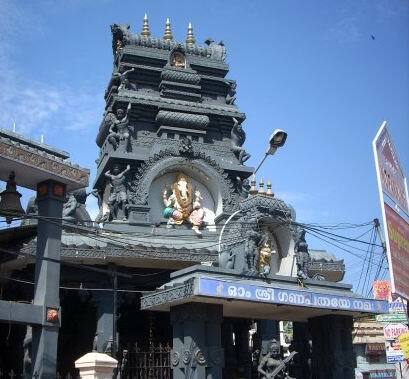 Pazhavangadi Ganapati Temple is one of the main temples in Thiruvananthapuram. The temple is situated within walking distance from Sree Padmanabhaswamy Temple of Lord Vishnu. Other deities worshiped at Pazhavangadi Maha Ganapati Kovil are Lord Ayyappa, Goddess Durga, Nagaraja, and Brahmarakshas. Devotees can see beautiful paintings of the 32 forms of Lord Ganesh inside the temple complex. The original Ganesha idol installed in the temple was worshiped by a soldier of Travancore Army stationed at Padmanabhapuram. In 1795 A.D, when the capital of Travancore was changed to Thiruvananthapuram, the garrison was also shifted and the idol was installed at its present place at Pazhavangati. The main vazhipadu (offering) of Pazhavangadi Maha Ganapati is the breaking of coconut for removing obstacles and fulfillment of any desire. Ganapathi Homam, Appam, and Modakam are other main offerings to Lord Ganesh. To enter inside the main complex male devotees need to wear Mundu (Veshti or Dothi or Laacha). Any traditional dress code like Saree, Churidar, Salwar Kameez, or Pavadai Chattai is allowed for ladies. Sree Pazhavangadi Mahaganapathy Temple is just 1.5 kms from Trivandrum Central Railway Station and Thiruvananthapuram Central Bus Station. The nearest City Bus Stand is East Fort (Kizhakke Kotta). Trivandrum International Airport is about 8 km from the temple.